This is a special series of Engineering Drawings originally created between the years 1913 and 1916 as required by the Interstate Commerce Commission and regularly updated as needed thereafter. 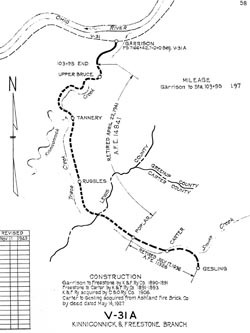 These drawings, officially labeled “Right of Way and Track Map”, but commonly referred to as “Valuation Maps”, show all of the property owned by the railroad including the entire right-of-way, track layout, curvature, building and structure locations, etc., for the entire railroad system, mile by mile. The drawing size is standardized to be 24″x50″. The Interstate Commerce Commission (ICC) and railroad engineers undertook a massive project to inventory almost every aspect of the U.S. railroad system for the purpose of determining a net worth for each railroad. This value was then used to calculate passenger and freight rates. Due to the level of detail that is generally shown, valuation maps are some of the most popular records among model railroaders, historic preservationists, railroad history buffs, and even genealogists. We have the original, ink drawn on linen, drawings which were completed in June 1916. 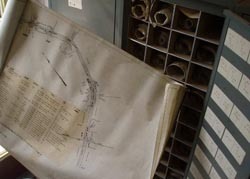 We also have blueprint or blueline copies of a very few maps that have been updated with revisions. These maps are organized by sheet number in their original cabinets.